Remember the little signs that identify you with other members of your tribe. Drummers always carry a pair of sticks with which they perform extraordinary callisthenics or rotate in an alarming fashion. In extreme display mode they also carry a cymbal under one arm. There is no mistaking drummers. The badge of office for a trumpet player (other than a small tapir-like projection on the upper lip) is a trumpet mouthpiece with which to imitate duck calls. All very jolly, if somewhat predictable. 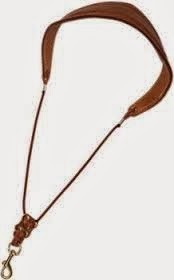 However, for saxophone players it is the sling, to be worn in all licensed premises and very probably in bed. This can lead to sling envy, because saxophonists are forever weighing up each other’s hooks. The bigger hook, the bigger the instrument. For example, the bass saxophone has to have a big hook and the alto saxophone’s is somewhat smaller. In Darwinian terms the bass sax should lead the herd, but in fact it is the alto who calls the tunes. Slings of course, are open to abuse. 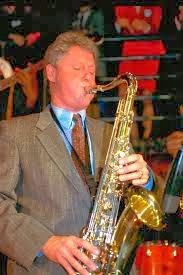 When such things mattered, civilians have been known to pose as saxophone players by wearing one. “Oooh, are you in the band?” came the desired response. “Lead alto, darlin’,” was the shameless reply. On the positive side, wearing a sling would get you into a late night watering hole. “Just finished the gig,” you say to the 800lb gorilla on the door, diffidently displaying your sling. “Sling your ‘ooh,” he would retort until money changed hands. However the advent of jumping-up-and-down music has washed away these icons of the past. Wear your sling with pride but don’t forget your tambourine. 0 Responses to "Peter Bocking… Slings His Hook: The Bocking Memorial Blog #3"